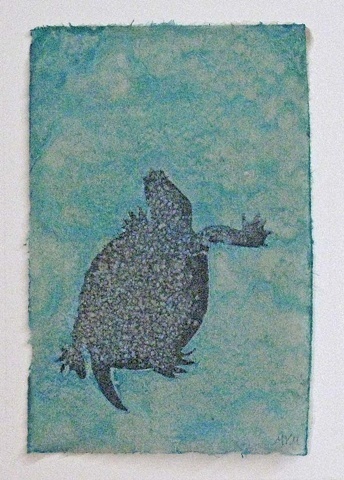 I sprayed pigmented cotton pulp through a stencil onto a wet base sheet of kozo paper to form the turtle image in this artwork. More pulp spraying added the "water." The completed paper painting was air-dried on a wooden board. The finished piece is mounted on a white cotton rag mat. All materials in the stenciled paper itself and the matting are of archival quality.